Yesterday, a wasp stung me on the cheek. I was painting under the eaves of an outbuilding and didn’t see the nest–right behind me. Wasps start small. Their early nests will hold only a handful of builders. If you’re lucky, that’s what you’ll encounter. This season, I must have knocked down over 30 wasps nests. “Wasps,” by the way is the generic name for any number of stinging insects we mistakenly call “bees”: yellowjackets, wasps, and hornets. I don’t assume these creatures experience remorse or regret when their nest has suddenly disappeared. They soon disperse to start anew elsewhere. 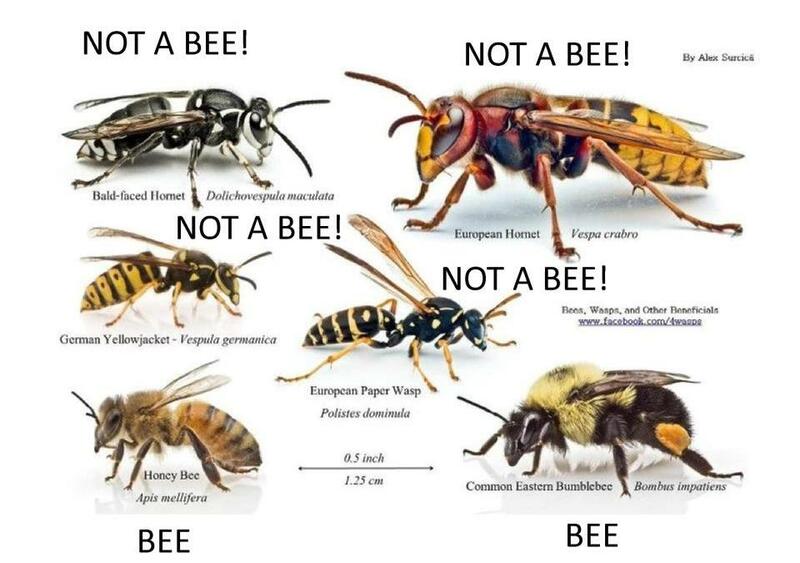 If you work on the land, you’ll run into them: bees, hornets, wasps, yellowjackets. When Jill and I bought our farm three years ago, I accepted that I’d get stung. Fortunately, I am not allergic. Still, as a child, few fears loomed larger than the prospect of stumbling into, or falling onto, a bee’s nest. I recall the time my brother stepped on a yellowjackets’ nest and then ran home screaming as the bees swarmed his face. My mother carried him into the shower and spent twenty minutes picking yellowjackets off of him. His swelling was so bad, he was hardly recognizable for a week. Sure, as a boy running barefoot through the grass, I would occasionally incite the wrath of a busy bee gathering its tiny saddlebags of pollen from clover or dandelions. I had to wonder: smashed by my oblivious foot, how did the bee manage to turn over and sting me? To soothe my wound, my mother would make a poultice of baking soda and salt. And I’d spend the rest of the day with my injured foot elevated on an ottoman as I watched cartoons on TV. Bee stings were mostly an infrequent, summer hazard. I’ve been stung more in the last three years than in all my life. My first summer here, hornets got me when I went to hitch one of our trailers. The trailer was parked at the back of the property and hadn’t been moved in months. When I raised the trailer’s tongue to hitch it, I felt a blistering bite on my right hand, then another on my left, then another. Confused, it took me too long to realize I had disturbed a hornet’s nest tucked inside the hollow of the trailer’s hitch. That day I wasn’t wearing work gloves. The excruciating pain abated in about four hours. And I was amazed: Done? Not so bad! I felt so manly. But then: the next day my hands were swollen, blistered, and itchy. The itching was excruciating and lasted for days. So now I know–it’s not the pain of the sting I dread; it’s the aftermath. You’ve got to be vigilant. They could be anywhere: in a thatch of weeds, behind a roofing tile, under a few loose bricks, inside any small random hole you might find on the siding of a barn. Yellowjackets are the worst–mean little shits. Very aggressive. My first encounter with them on the farm was the afternoon I was trying to chainsaw through a thicket of wild grape vine. Then I felt an electrifying sting on my right ear. I fell back, dropped my chainsaw, and saw the little warriors pouring from the brush–I had hit their nest. Fortunately, I was behind them, not in front of them, and was able to fall back farther. Also: I was wearing gloves and long sleeves (always wear these when working in the brush!). So, swiping the yellowjackets from my clothing, I escaped with only a single sting. 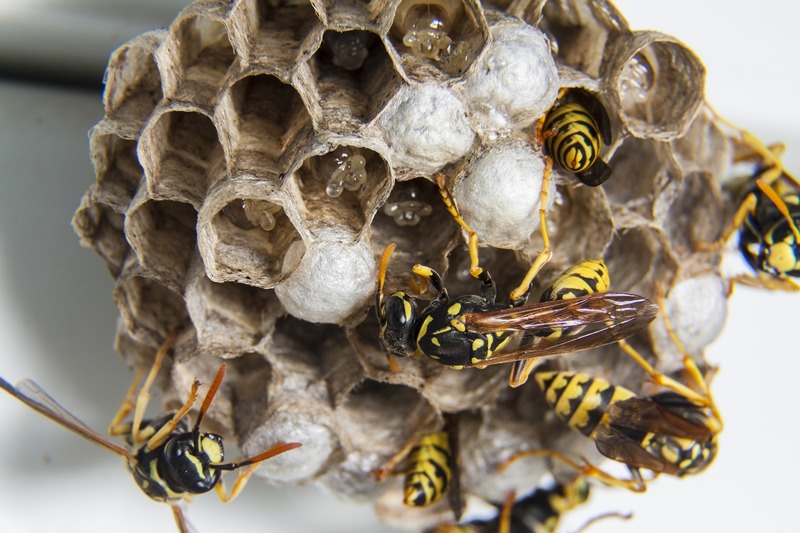 Keep in mind that wasps, yellowjackets, and hornets can sting and sting again. Just the other week, I was in an outbuilding, moving around some stored furniture. I was about to move an old dresser, when it occurred to me that I should examine its underside. Sure enough, I discovered a hornets nest right where I was about to lay my hand. At least 20 hornets were on the nest. I shudder to imagine the damage they would have inflicted before I could have escaped. You should know that the problem with killing bees, when you’re attacked, is that a crushed bee releases a pheromone that attracts other bees to the attack. If I have to crush a cluster of wasps or hornets, I do so with a very long pole. If a piece of the hive remains, they will return. So a jet a water is also advisable to wash away all remnants as well as any hovering, angry wasps. The touching thing about honey bees is that each is good for only a single sting. In depositing their barbed stinger, they rupture their abdomen as the stinger remains when they pull away. It’s a kamikaze proposition: their wound is irreparable and fatal. Unlike with other stings, you’ve got to remove the honey bee stinger; otherwise, it continues injecting you with toxins. Did you know that America’s common honey bee is actually an import, from the Mediterranean? That’s why they must be carefully protected during our harsh winters. Not only that, but (during their first couple of years) you must feed honey bees (sugar) through the winter–they have no other way to survive. I’m a big fan of their close relative, the bumble bee. They are the most active pollinators, as you can see on a farm like ours, where the bumblers are climbing over every other flower all day long. They are so intent on their harvesting, you could almost pet them as they work. However, if you get close to their nests (bumble bees build nests in and under things, like yellowjackets), the “soldier bees” will attack. Every nest has a cohort of guardians who will divebomb intruders. I happened on a bumble bee nest last season when I was picking weeds, which resulted in another sting on my cheek. Our two hives of honey bees are thriving, so we have hope that they’ll survive the winter. As for the wasps/hornets, I’ll be knocking down nests for another couple of months in and around our outbuildings. Come winter, only the queen of these wasps survives, hibernating under log or a pile of brush. Kind of remarkable how so much comes from so little.